CALGARY -- The Calgary Flames understand that in light of their surprising success in 2014-15, expectations heading into this season are considerably higher. "It's a whole different ball game now," forward Joe Colborne said. "We had that 'everyone against us' mentality [last season], and that's easy to build around. You look at the top teams, they've learned how to win. It's easy to be second place; it's never easy to be first place. That's where we have to look at it. Now people are saying nice things about us. It's going to be a challenge to make sure we don't listen too much to it, just like we didn't listen when they said bad things last year." The Flames were third in the Pacific Division with a 45-30-7 record, a 20-point increase from 2014-15, to qualify for the Stanley Cup Playoffs for the first time since 2009. With an opening-series win, Calgary extended its season and advanced to the Western Conference Second Round for the first time since 2004, and the second time since winning the Cup in 1989. The additions of forward Michael Frolik and defenseman Dougie Hamilton bolster a roster returning relatively intact. Calgary added Frolik on July 1, signing the former Winnipeg Jets right wing to a five-year contract reportedly worth $21.5 million. He'll be asked to help anchor a middle-six position for the Flames with the majority of Calgary's forward core returning. That includes the top three of Jiri Hudler, Johnny Gaudreau and Sean Monahan, who collectively led the Flames in scoring in 2014-15. The first line will again be counted on to provide the large bulk of the scoring. Hudler (76) and Monahan (62) each established an NHL career high in points. No rookie had more points than 22-year-old Gaudreau (64), who was a Calder Trophy finalist. Monahan avoided regression in his second season to score 31 goals, and coach Bob Hartley expects Gaudreau to have similar success. "Johnny, he's a competitor; he's a great kid," Hartley said. "You just look at him. Johnny's not working; he's playing. He's having fun. You look at his conditioning, he's in great shape. Johnny's a good young pro, plus at the same time being surrounded, just like [Monahan] last year, by the culture of our veterans, it really helps those young players to play good, to prepare well. "There's no complacency in this organization. It's always earned, never given. They know that it's for everyone. Whoever will dare to sit on the sofa might never get up." Twelve Calgary forwards have a one-way contract, and Gaudreau and Monahan each will play the final season of his entry-level contract. The Flames had 14 forwards play at least 48 games last season, not including Frolik, who played 82 games for the Jets. Two more, 19-year-old Sam Bennett and 23-year-old Micheal Ferland were standouts for the Flames in the playoffs despite their inexperience. Prospects Emile Poirier, Kenny Agostino, Bill Arnold and Drew Shore are seeking full-time spots too. They aren't likely to usurp Mikael Backlund, Matt Stajan or Lance Bouma, but Brandon Bollig and Mason Raymond may find themselves in stiff competition to keep their positions on the roster. "I'm sure you guys looked at our lineup. I'm sure everybody in Calgary, players included, look at our lineup," Hartley said. "We have how many forwards on NHL contracts? We have how many forwards that can play NHL hockey?" The Flames added to a position already considered to be their biggest strength when they acquired Hamilton from the Boston Bruins on June 26. Mark Giordano finished sixth in Norris Trophy voting despite missing the final 21 games of the regular season with a torn biceps tendon. Calgary's captain established NHL career bests in assists (37) and points (48) before sustaining the injury in late February. 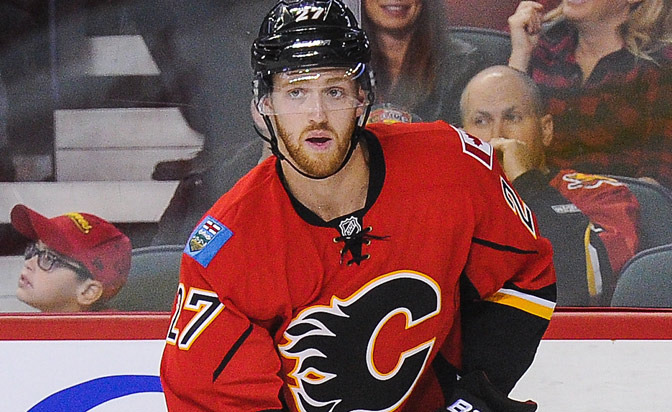 TJ Brodie, Giordano's primary defense partner, established NHL career highs with 11 goals, 30 assists and 41 points. He will miss the start of the season with a broken right hand. Like Brodie and Giordano, Kris Russell and Dennis Wideman set personal bests. Wideman's 15 goals and 56 points were new highs for the 32-year-old; Russell, whose 30 assists and 34 points were the most in his eight-season career, established an NHL record for most blocked shots in a single season with 283. Hamilton reached NHL career highs in 2014-15, leading Bruins defensemen with 10 goals and 42 points. "We have guys that do it in different ways," Giordano said. "I think we're going to have to learn to play with different guys in different situations. We're excited. We're looking forward to being a big part of this team. We had a lot of success last year, and I think as a core, we got even deeper this year. I think we're definitely a deeper group this year." Deryk Engelland, who stepped into a larger role in Giordano's absence, is a likely candidate to round out the defense, but there will be competition from 27-year-old Jakub Nakladal, and prospects Kenney Morrison, Tyler Wotherspoon and Brett Kulak. Ladislav Smid, who continues to recover from neck surgery in January, will be a candidate when deemed healthy enough for contact, which is expected in mid-October. Calgary's goaltending will look remarkably similar to last season. Returning are the three to suit up for the Flames in 2014-15: Jonas Hiller, Karri Ramo and Joni Ortio. The wrinkle is that each has one year remaining on his contract and would require waivers to be assigned to the American Hockey League. It was Hiller who carried the bulk of the load a season ago, going 26-19-4 in 52 games with a 2.36 goals-against average and .918 save percentage. Ramo, who went 15-9-3 with a 2.60 GAA and .912 save percentage, was the goaltender when Calgary lost to the Anaheim Ducks in the Western Conference Second Round. Ortio, who played six regular-season games, was 4-2-0 with a 2.52 GAA and .908 save percentage. He's the youngest of the group at 24 years old (Hiller is 33; Ramo is 29). "It's going to be a unique situation, having three goalies on one-ways, but I don't think it changes that much for us three," Ortio said. "We all have the same goal: We want to play; we want to be the one who starts Oct. 7. It doesn't change our approach in any way. We still want to be the best goalies at camp. It's different, but it's still the same." The Flames had the 13th-ranked power play last season (18.8 percent), fueled primarily by Gaudreau, Monahan and Hudler, who combined for 24 goals and 56 points with the man-advantage. Calgary's next group -- Colborne, Josh Jooris and Curtis Glencross, now an unrestricted free agent on a tryout with the Toronto Maple Leafs -- combined for 18 power-play points. The defense helped close the gap. Wideman tied Gaudreau for the Flames lead with 21 points, and Giordano and Russell had 14 points each. Calgary's penalty kill finished 20th in the League (80.6 percent), despite featuring three of the NHL's top shot-blockers: Russell, Wideman (184) and Brodie (178). Hartley is the reigning Jack Adams Award winner. Last season, his third with the Flames, they enjoyed a 20-point spike from 2013-14, the most of any Western Conference team and third most in the NHL. Under his guidance, Calgary was tied for first place in the NHL in overtime wins (nine); second in third-period goal differential (plus-31); third in wins when trailing entering the third period (10); and fifth in points percentage when leading after two periods (.923, 24-1-1). The Flames blocked 1,557 shots, the highest single-season total since the statistic was introduced. Hartley is again joined by associate coach Jacques Cloutier, assistant Martin Gelinas and goaltending coach Jordan Sigalet.